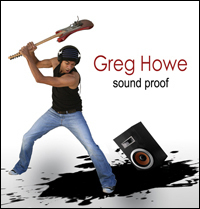 Sound Proof (Tone Center) is guitarist Greg Howe's first solo album in about 5 years. Possibly his most dynamic album to date, it's loaded with great grooves, stellar playing, and a wide variety of writing styles. One of the most influential and technically accomplished players in the progressive guitar scene today, the line on Howe is he's a former "shred guy" who has morphed into a "fusion guy." Other guitarists have made this stylistic shift as well, but the results are often debatable in my opinion. Usually the "fusion" aspect is reflected more in the writing than in the playing. In Howe's case, however, there really is no debate - the guy has strong, legitimate jazz chops that show through in his improvising and his writing, and that aspect of his style is apparent throughout this new album. The first thing you'll noticed about Sound Proof is it's sense of humor. In a move similar to what Project Z did on their self-titled debut, Sound Proof features some funny "skits" scattered throughout the disc. Whether it's a high-falutin music mogul telling Howe to write him a song, or a phone message from a guitar tone connoisseur going on and on about his gear, these brief humorous moments break up the song listing nicely, and reward the listener for playing the album's tracks in order from beginning to end; an antique notion since the advent of the mp3 player. These short breaks, plus the playful nature of some of the songs give the whole album a looser feel than Howe's previous releases. It's as if, despite all his technical ability and depth as a musician, he wants people to know he doesn't take himself too seriously. Howe is backed by a great supporting cast here. On his previous album Extraction (2003 - Tone Center), Howe recorded with some high-profile legends (Dennis Chambers played drums, and Victor Wooten played bass). He takes a different approach with Sound Proof by working with some lesser-known, yet very talented sidemen - Jon Reshard plays bass, Gianluca Palmieri plays drums, and David Cook handles keyboards (Cook also played keys on Extraction). All of these guys sound great, and Howe gives them plenty of of room to shine. An album's opening song often sets the mood for the whole record, but "Emergency Exit" seems to challenge that theory a bit. It's the heaviest, most "prog"-like tune on Sound Proof, and it's 5/4 groove and "out there" guitar solo made me wonder if this is what Planet X would have sounded like had Howe actually joined that band a couple of years ago, as was nearly the case. Palmieri really tears it up on this song also with his strong odd-meter playing and a killer drum solo. Up next is a great instrumental version of the funk classic "Tell Me Something Good." It's a major mood-shift from the album's opener (Howe's point perhaps? ), and a strong showcase of how dynamic Howe's new band can be. By opening the album with these two radically different songs, it's as if Howe is preparing the listener for the many moods yet to come. One of those moods is Latin music. Howe has recorded Latin-influenced pieces in the past (e.g, "Contigo" and "Just Kiddin"), but "Reunion" is his most playful excursion into the genre yet. And it's easily one of the best songs on the album - Cook's piano work here is top notch, and Howe's crazy effects-laden solo really adds to the song's loose, fun vibe. Howe's maturity as a writer is well-displayed on the highly melodic "Morning View." This piece has a laid-back R&B feel, and features two stellar guitar solos - first acoustic, then electric. Both solos showcase one of Howe's great strengths - his ability to drop in short effective blues phrases into just about any progression. In stark contrast to his "Morning View" solos, Howe's solo on the slow-and-heavy groover "Walkie Talkie" is loaded with crazy outside lines. This song is also has some cool guitar/bass doubled lines, and another great drum solo by Palmieri. One aspect of Howe's playing that has continued to mature over the years is his vocabulary as an improviser. Sound Proof's best example of this also happens to be it's strongest track compositionally - "Side Note." The song itself is upbeat and fun - the open string melody has an almost Bela Fleck neo-bluegrass quality, though Howe's trademark heavy-funk writing style is still readily apparent. Howe's approach to the solo section's jazzed-up progression, however, is what really sets him apart from other former "shredders" who have made the jump to fusion. Sure, he peels off plenty of his patented barring and two-handed legato runs, but even more impressive is how he addresses the chord changes here. His slick altered lines reveal a deeper, jazz-influenced vocabulary that you don't hear from other players who also emerged from the late-80s "golden age" of shred. Furthering that point, Howe follows "Side Note" with the straight-ahead acoustic jazz piece "Sunset in El Paso." His technique is impeccable on this song, and his lines are the real thing. "Child's Play" will surely be seen by many as one of the best songs on the album, and deservedly so. It's highly dynamic, has a fantastic groove, and features one of Howe's best solos on the album. Sound Proof's final "song" is it's title track, and it's a great example of everything Howe does well, both as a composer and an improviser. Throughout the years, one of Howe's trademarks as a writer has been turning a song on a dime by dropping in a soaring melody over a cool chord progression, no matter how heavy or funky the song happens to be at that point. The title track is one of several songs on Sound Proof where Howe uses this technique to great effect. It also has a great, jazzy guitar solo, and a fantastic bass solo by Reshard. "Sound Proof" may be the final song, but it's not the final track. The album closes out with "Connoisseur part 2" - the longest skit on the album where the same guitar tone junky featured in an earlier phone message skit calls Howe back, and rattles on for over two minutes about his efforts to get a great tone. Definitely a fun way to end a great guitar recording. Sound Proof is arguably Greg Howe's best album ever. Extraction and Parallax were awfully good as well, but in addition to the great writing, dynamic production, and amazing guitar playing, Sound Proof showcases the jazz influence in Howe's style better than any of his previous efforts. No player I can think of has crossed over from shred to jazz fusion more authentically than Greg Howe has, and Sound Proof is his best example of this shift thus far. Dennis Hamm: Keyboard solo on "Side Note"
A great album indeed! Playing in my town would would be equally great. So great to see Greg Howe getting the recognition he deserves. I couldn't agree with you more "Sound Proof is arguably Greg Howe's best album ever". I agree: Greg Howe has become a truly Jazz-Fusion musician.This album prooves it. He has the groove that reminds me(aside the obvious stylistic differences)the beginnings of Robben Ford with The Yellow Jackets. Couldn't agree more! Great review of a fantastic album by Greg Howe. I also believe it may be his best yet. The depth of his playing is astounding to me, and his taste is impeccable. I have to say that this disc was truly worth the wait. It's really fun and accessible, with a little something for just about everyone. It's hard to argue with those that say it may be his best work yet. Here's hoping that Greg continues his exploration of the Latin sound. I've always wanted to hear some "Latin shred" (for lack of a better phrase) and "Reunion" serves as a great example of that. More, please. How much did I like this? Well, it's the first disc I've actually bought in over a year. My money could not have been more well spent. Fantastic review of a supernatural, STUNNING album! Particularly "Child's play" connects to my senses in a really special way. I didn't felt that emotional vibe, that good since "Jump Start", and Introspection album in general. I'm not necessariy saying neither these two mentioned songs belongs to the same style, nor recall the same mood. Not even close. But both of them, for some reason, evoke me the same positive, beautiful feeling and appeal to my 'inner groove' in a very strong way. Undoubtedly it is one of my all-time fave ones from Greg, ever; and a BRILLIANT SONG in any case. Finally, I specially like the cool fact that is placed just after "Write Me A Song". Cheers Greg!! Luis - I agree, and thanks for the kind words!